Our Planes Have Arrived at the Hangar for Winter! The planes are out of the water and in our hangar in Minaki! It’s hard to believe that off-season work on the planes has already begun. 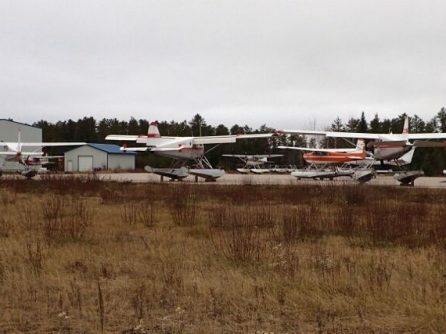 The bay at the Nestor Falls Fly-In base has started to ice over, though, so there’s no doubt that winter is here. To get to the hangar, we fly the planes to Minaki Aircraft Repair. The boys at Minaki load each plane onto a trailer in the water. They’ll pull the plane and trailer out of the water using a truck. It’s actually a lot like pulling your boat out of the water at the end of the season. Dave will try to get up to Minaki as often as he can during the winter to talk with Jaime and check on our projects happening. Jamie, the head engineer over there, always does a fantastic job! The hangar also has a 3,000′ paved air strip so we can convert the planes from wheels to floats or skis. Yes – skis! You can put skis on a plane in winter to take off and land in the snow. There are some folks who do this and the view of Canada’s snowy wilderness from the sky is just incredible. We can’t wait to have our planes back at the dock. Thanks to the maintenance boys for keeping our planes in the air all summer long.